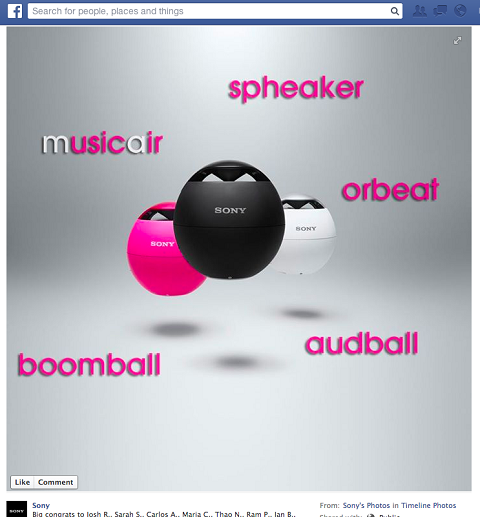 In 2013, Sony U.S. president Phil Molyneux turned to the general public to help develop a name for the company’s new wireless mobile speakers – in the shape of pink, black, and white balls. In an official blog post, Molyneux explained the challenges of product name development in today’s marketplace, siting the sheer number of products already on the market to international laws to registered trademarking issues being part of the problem. Sony turned to its online fans, followers and loyal customers to help name their newest product. The contest was also posted on Sony’s website and social media sites. In the contest rules names could be submitted in the comments section of the post and top 5 names would ‘get a new set of ball’. “A gadget that looks like this with the potential to get cheeky needs more. I want to change it … no more “Bluetooth Wireless Mobile Speakers.” And I’m looking to you for help. I need your input and inspiration. Tell me your thoughts and ideas on how we can bring this product to life through a name.” said Molyneux on the Sony website. In the end Sony execs went with The Sony Bluetooth Speaker Ball. Involving your clients in the naming of a product can be a great way to beta test or pre-market your product which could result in early sales at the time of product launch. Be clear on how the winner is selected and who has final say in the name. While you are opening up the dialogue, you still need to keep control over your business. Make if fun, while depending on the measure of success Sony’s end results are questionable, the contest did reveal a more human and humourous side of Sony’s executive team. Humanizing your business through social channels can go along way in securing client loyalty. Close the loop. Be sure to announce winners and thank your audience for participating, regardless of your results. Try using online polling tools. It can be a basic like or comment on a blog or Facebook post to using free tools such as SurveyMonkey. Over 15 years of branding, marketing communications, graphic design, print management, social media marketing and web design experience.